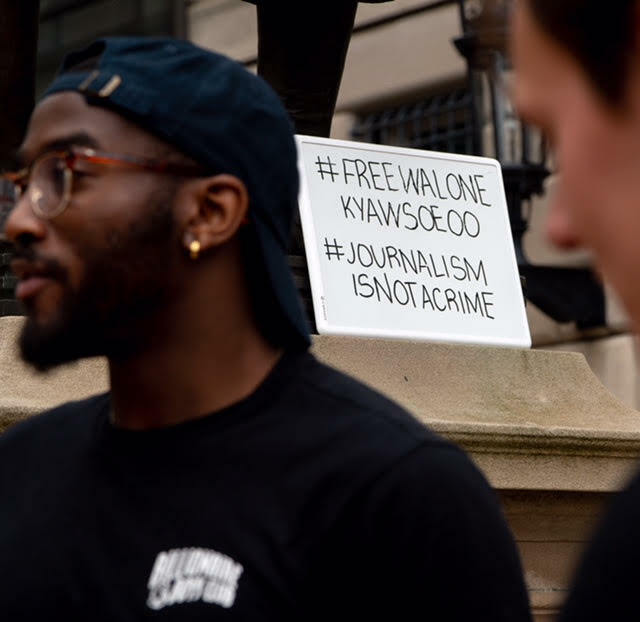 It’s a moment of advocacy and solidarity on Columbia’s Morningside campus on behalf of Reuters journalists Wa Lone, 32, and Kyaw Soe Oo, 28, who were sentenced to seven years in prison on September 3, 2018 by a Myanmar judge after being found guilty of violating a decades-old law on state secrets. The Burmese nationals had been investigating military crackdowns and human rights violations in Rakhine state, including the massacre of 10 Rohingya men in Rakhine’s Inn Dinn village on September 2, 2017. 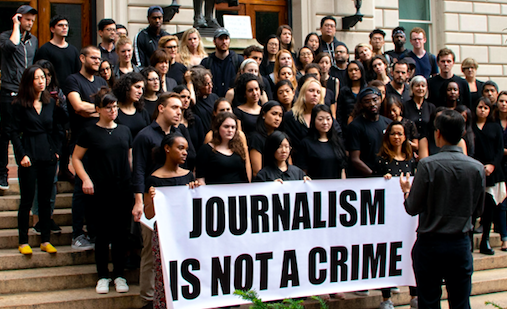 The advocacy effort at the journalism school in New York City was organized mainly by students in professor Ann Cooper’s reporting class. Beginning at 11 a.m. in Pulitzer Hall, the students dressed in black and held up signs, many handwritten in black ink on dry erase boards, with messages of support for the Burmese journalists. The students were inspired by the earlier protest efforts led by the Protection Committee for Myanmar Journalists who began wearing black T-shirts to “signify the dark age of media freedom” and advocate for the release of their colleagues, according to Reuters. 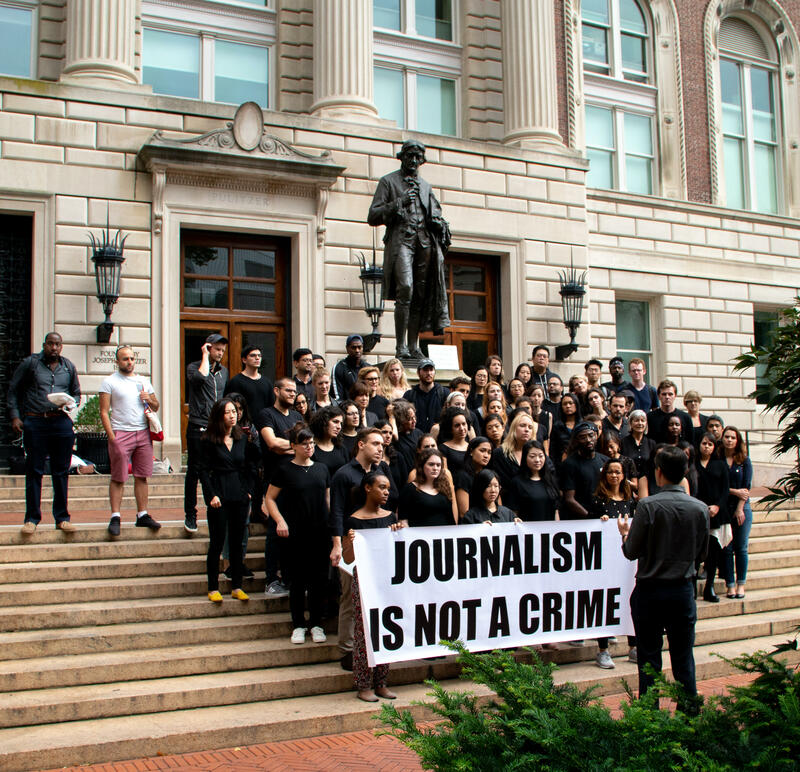 The entire journalism school was asked to participate in person or across social media, and students from other professional schools at Columbia were also invited. 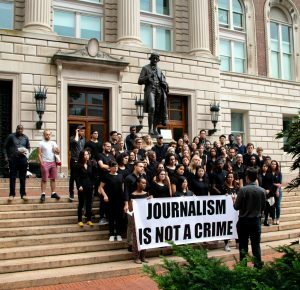 While advocacy efforts such as the one at Columbia may seem merely symbolic, they hold special significance for the jailed journalists and reporters around the world who face similar risks. Efforts to support Wa Lone and Kyaw Soe Oo while in detention began last year at Columbia when journalism students collected books to send to the reporters in prison following a specific request for books by Wa Lone. “I think we all hoped that would help them pass some weeks or months until they were freed, because the court case against them was so ridiculous. But now they face seven years in prison. So our new students this fall have organized an effort to tell them, once again, you are not forgotten,” Cooper said. Around seventeen of Cooper’s current reporting students from the Class of 2019 took the lead in organizing the day of advocacy on behalf of Wa Lone and Kyaw Soe Oo. The seven-year prison sentence serves as a reminder of the challenges and limitations journalists face in doing their jobs and defending human rights. These realities are particularly pertinent for students of Columbia Journalism School, many of whom dream of future careers in international and conflict reporting. And now, more than ever, the stakes are especially high. The Committee to Protect Journalists reports that for the second year in a row the number of journalists imprisoned for their work has reached a historical high. The advocacy efforts on campus help the students to recognize the importance of the lessons they learn in the classroom on keeping themselves and their sources safe in difficult environments. “It’s my goal to make sure that all of our students leave journalism school with a healthy appreciation of the risks faced by so many reporters around the world— and with the skills and knowledge to assess and deal with those risks,” Cooper said. 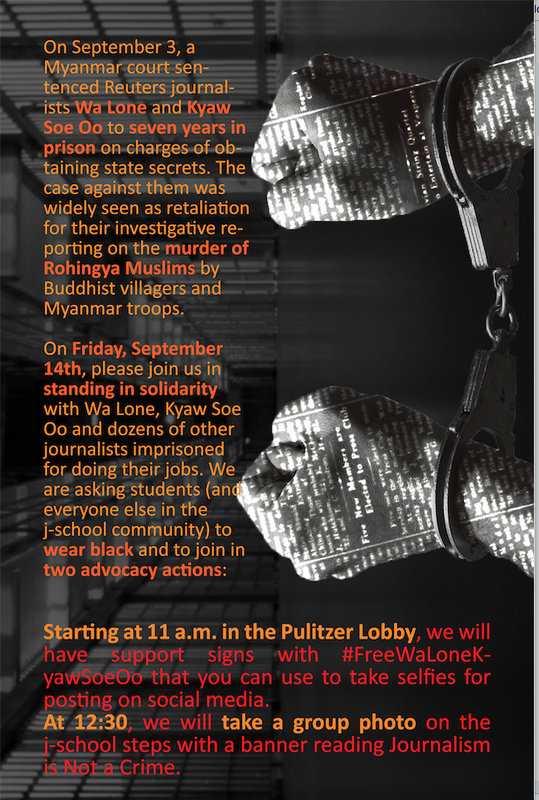 The recent case of the Wa Lone and Kyaw Soe Oo hits particularly close to home for some of Cooper’s students. One who graduated this past May worked with Wa Lone at a newspaper in Myanmar, and another had met Wa Lone’s brother while reporting from the country. Ashley E. Chappo is a recent graduate of Columbia University School of International and Public Affairs, where she studied human rights and international conflict resolution, and Columbia Journalism School, where she studied multimedia and investigative reporting. You can follow her on Twitter @AshleyChappo. She is editor of RightsViews.